Have you ever noticed how some things go together so well, that it’s hard to imagine one without the other? What if Abbott didn’t have Costello, or if Teller tried to take his act on the road without Penn? Apart, they don’t work at all, but together, their synchronicity is perfect. Newton’s Third Law says “for every reaction there is an equal and opposite reaction” (science lesson for today, kiddies), and since we have order, we must have disorder as well. Look around you’ll see it. On our recent road trip vacation to the Black Hills of South Dakota, we stopped in Worthington, MN for dinner. Sitting along I-90 in in the Southwestern corner of Minnesota, 12,000 people call it home. And yet, Tesla seems to think it’s a great place to put several of it’s vehicle charging stations. I’m pretty sure no one owns a Tesla in Worthington, but perhaps they are thinking about it from a “fly-over” concept…you need something out in the middle of nowhere. Oh wait, that’s not Worthington. The middle of nowhere would be about 4 or 5 hours to the West on I-90. There is nothing there. NOTHING. Except jelly rolls of hay, the occasional herd of cattle, and sometimes a few trees, half of which are dead. Good thing we are such wonderful conversationalists. “Honey?” “Yep”. “Um, I forgot what I was going to say, sorry”. “OK, tell me later”. I’m happy to say we survived that road trip, marriage intact. We still like each other after a week of togetherness in the car. We’ve been alone on vacations before, when we’ve gone camping in the Boundary Water Canoe Area Wilderness. If you’re not familiar with it, it’s located in the northeaster part of Minnesota, and is almost a million acres of unspoiled wilderness. You can only access it by canoe and feet. Whatever you need you carry in on your back, and I’ve somehow allowed him to convince me to go up there four times. Because he’s done it so many times, I just rely on him to navigate us through the lakes, and make sure we get camp set up, have firewood, and have dinner. On this trip, the roles were reversed, and he relied on me, and our trusty navigation system (which mostly worked, although Mark Fields at Lincoln Motor Company has some explaining to do about why he let them remove the option of directly entering GPS coordinates with the latest ‘upgrade’, but I digress). The sights were indeed, interesting. South Dakota, on the other hand, is more than 49 million acres. Along I-90 it’s lots of ranch land: dry, brown, ranch land. Scattered clumps of trees here and there, broken up by dead limbs, and accented by the occasional heard of cattle. About halfway across the state you get a brief respite as you cross the Missouri River, then back to kind of boring. Closer to the west it perks up with glimpses of the badlands from the highway, and then, finally, you’re there. The home of the 4 faces, the land of “Dances With Wolves” and Black Hills Gold. The place where Cary Grant fell in love with Eva Marie Saint in North by Northwest and climbed around Mt Rushmore (not really, the Park Service is funny about that stuff you know!) and where a little boy plugged his ears in the cafeteria before Cary Grant fired his gun (really! Watch the movie again.) If you’ve never been to western South Dakota, take the time. We had so much fun in our 5 days there, and are already talking about another trip. Besides time at Mt. Rushmore, we hiked up to Harney Peak, drove Needles highway in both daylight and darkness (I don’t advise that! ), spent a day in Spearfish Canyon and stopped at Roughlock Falls and the Dances With Wolves film site, and so many other things. I have to say Harney Peak is one of the most difficult things I’ve ever done. You start climbing at about 6000 feet of elevation, go to 6500 feet or so, then down to 6200-6300, then up-up-up to 7200. It’s not a nice, soft, sandy trail either. It’s boulders, tree roots, rocks. It’s HARD. 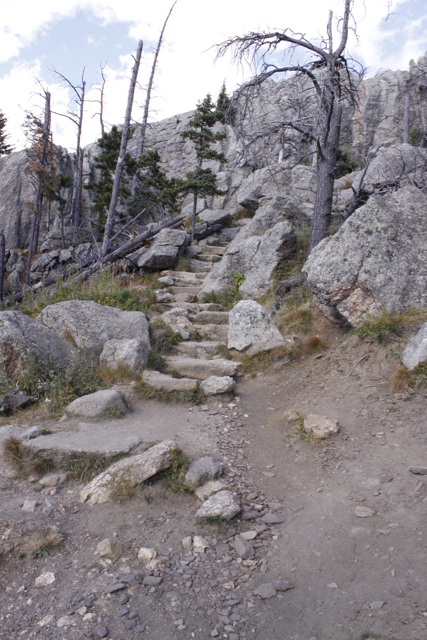 Last part of the Sylvan Lake Trail up to Harney Peak, South Dakota. The guides say plan 2-4 hrs to make it to the top, we did itin 2.5. If you do it, wear hiking boots, and take way more water than you think you need, plus snacks, some toilet paper and a baggie just in case nature calls, as there are no toilets. At the top is a stone fire tower built in 1939 by the CCC, and it looks over 4 states. The view is breath taking, stunning and absolutely worth it. I was so overwhelmed, I could not have done this 2 years ago and am so grateful for the ability to have come this far. 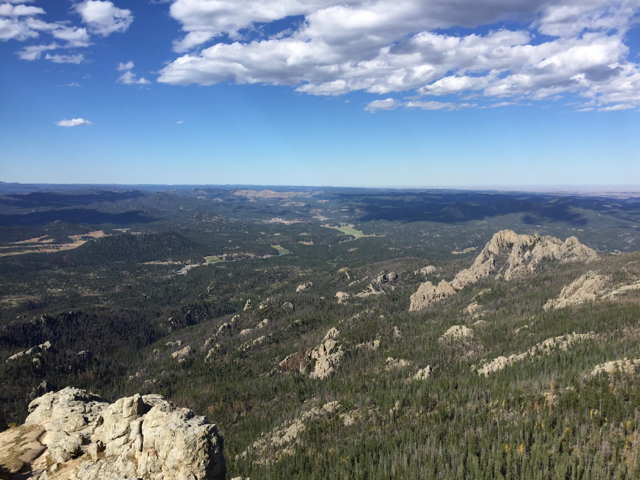 View from the top of Harney Peak, South Dakota. Elevation 7206 ft. But you know what they say, what goes up, must come down…and thank goodness the walk down was better than up. We even met a father son team from Duluth, and strangely enough the son asked me what I did for a living because he said “I would have guessed you’re a nurse”. When I asked him where that came from, he said that it was from how I’d been talking to his (elderly) father in a nurturing way. Turns out son and I used to work at the same care center in south Minneapolis back in the mid 1980s, and knew some of the same people. What an odd world! Now if only we could have teleported back home again and not driven across South Dakota a second time. Oh well, maybe by our next trip. I hear quantum physics is making great strides. ← And Now, a Word From Our Sponsor…. You entertained me first thing this morning, Beth. Thanks. Thanks Brenda, I’ve done my job! !